This week I got to play Star Wars: Age of Rebellion. Read on to find out my thoughts on the game. It’s surprising how may Japanese role-players seem to get started on Call of Cthulhu. I have no idea why, but, where most westerners start with D&D, and might even refer to all rpgs generally as “D&D”, Japanese players have a firm foundation is the mythos. Certainly all of the Japanese players I’ve met, mostly teenagers, can’t get enough Cthulhu. Perhaps it has something to do with the ghosts and monsters that are so prevalent in Japanese culture? Justin Mullis writes for the Lovecraft eZine that Lovecraft’s work came to Japan in the 1940’s, and has had a major impact on many creatives, including anime and manga artists. Certainly, Lovecraft’s work has inspired a huge number of artists and game designers all over the world. Maybe that’s why Call is so popular in the Land of the Rising Sun. If you can find it, check out the anime Haiyoru! Nyaruko-san, but be warned, SAN loss awaits you. Subscribe to the blog today and receive a free copy of Avernos Secrets, your gateway to the world of Avernos. In a few weeks I’ll be introducing you to some of my friends, guest authors who’ve got some fantastic articles that are sure to inspire you. I got my first chance to play Star Wars: Age of Rebellion , playing the ace character Zal in a run of the beginner game. I love starter sets, because they’re well put together and easy to play, and ease you into the bigger game. The concept: It’s Star Wars, and you’re playing a Rebel up against the Empire. Sign me up. The action is set somewhere during the original Star Wars movies. In the starter, you’re tasked with infiltrating an Imperial base and capturing it for the Rebel cause. Fantasy Flight love to give you custom dice, and much of the mechanics revolve around rolling a number of dice against other opposing dice. This is all very intuitive, and it seemed to make for a faster game. Combat didn’t take long at all, and was very easy to understand. Components: I loved the map, the character booklets, the tokens and the dice. I don’t like that I can’t use my own dice for this game, but the dice compliment the game well. Fantasy Flight got better at making dice; the dice from my copy of Doom: The board game are fading fast, but dice from newer products are indented and should last forever. I only got to skim the rulebook, but it looks great, with plenty of pictures to inspire and examples and tables to clarify the rules. Characters: the included pregenerated characters were great. Out of three players, everyone felt some connection to their character before starting out. Personally, I felt that Zal, my character, would be loads of fun to play and I wanted to really explore her motivations in game. I’m also glad that the characters weren’t rubber stamped copies of Han Solo, Princess Leia, Chewbacca and Luke. You’re very much telling stories in a world where those characters are doing their own things. Unfortunately there are no rules for character generation in the starter, but it looks like you’ll still get a few sessions and levels out of the box before you need to expand your collection. In Short: Buy this game if you want to tell your own Star Wars stories. This box will get you started and set you up for expanding your game with other books in the series. This is the year of hoverboards and Star Wars hype, which is all good news for role-players. Today we’ll look at basic rules for hoverboards in Pathfinder and inspire you to tell the story of three daring Tie fighter pilots. Imagine your players faces when they discover the ancient artefact they just uncovered is a hoverboard. Here’s my proposal for these awesome rides in Pathfinder. The Fly skill gives us a great basis to work from, using a hoverboard is just like flying and generally uses the same rules. Hoverboard maneuvers are a little different. Hoverboard speeds: Hoverboards minimize resistance between the board and the ground, so are capable of intense speeds. Start with a base speed equal to the rider’s base speed +10. Going faster than this requires a Fly check, and each turn the rider can spend a move action to increase her speed by +5ft. So a human with a base speed of 30 rides easily up to 40ft a round and would have to make a DC 8 Fly check to reach a speed of 45ft per round. Note that hovering and riding slower than normal doesn’t require any checks, that’s easy stuff. Turning: hoverboards turn as the rider shifts his weight on the board. To turn sharply, the rider has to contend with his momentum. One way to overcome the direction of momentum is to use a foot or hand grab to swing the board around sharply. Ramps: If a rider takes a ramp of 45° or less, they can attempt to jump using their current speed as if making a running jump. They make the DC 20 Fly check for the ramp and then an Acrobatics check for the height or distance of the jump. Rails: To grind a rail, the rider needs to ride or jump onto the rail or ledge and make the Fly check each turn to maintain the grind. Ending a grind is a free action. Falling: Collisions at high speeds can hurt. For every 10ft of speed above the characters base speed (not hoverboard speed), a collision deals 1d6 points of damage. So a rider with a base speed of 30ft who hits a wall while riding at 40ft per round takes 1d6 points of damage, or 3d6 damage if riding at 60ft per round. Falling off works much in the same way, except that the damage is none lethal if the rider can make a DC 14 Acrobatics check to roll with the momentum of the fall. There you go. Marty McFly would be proud. Let me know if you try these rules out and happy riding. It took artist OtaKing77077 4 years to finish his short film entitled Tie Fighter, and it’s way impressive. With the Star Wars Age of Rebellion Rpg , plus the new Armada game and of course X-Wing , we have a great chance to tell the story of these three pilots. So, who are they, how did they get here, and why are they loyal to the Empire? I’d love to see someone write a scenario for this. Avernos opens up with Avernos—Secrets, a free web enhancement available to all blog subscribers. Subscribe today and jump into a world on the verge of destruction. Be warned, there’s no turning back. Getting in a quick RPG session is possible, but needs some work from the GM and all players involved. We played a 2 and a half hour session this weekend and here’s what we learnt. Prep: As a GM, you’ve got to be as ready as possible before you play. Pre-written adventures are great for this. If there are rules you’re fuzzy on, read up before you play. I made sure I knew all about flying before game, so my dragon could terrorize the skies without disrupting play. Bookmark those rules too. Players can really help the GM by sending character sheets in before the game and reading up on all their feats and skills. Setup: Similar to prep, but really, this is what you do when everyone is arriving, or just before. Roll20 is great for prep, because you can set everything up before hand. Make sure you have tokens or models for everyone, and a few pre-generated characters. Keep down clutter as much as possible. Really all you need is some paper, a pencil, the rules and a set of dice. Only add to this if it will make for a faster game. Game Time: Establish a turn order and stick to it. Keep things simple and focus on the fun stuff. When the party approached a beauacrat wanting to know about an artefact, it sped things up to give them a summary, rather than force them to probe for details. Players should roll attack and damage dice together and think about what they’re going to do when it’s not their turn. Aftermath: Really, fast games take real teamwork. Talk about what worked and how you can improve on things. Also, take the time now to get ready for the next session. If you’ve done the work, the next time around will be so much easier. I cooked a pretty good meal today. Garlic chicken, rice, onions, and cauliflower. It tasted amazing. The thing was that it looked plain, everything was a shade of white. As a GM, it’s our job to bring the excitement, to colour the world and spice it up for a fun session. This takes a number of skills, not least of which is story telling. At Rising Phoenix Games, our motto is Tell Thrilling Tales. That’s at the heart of everything we do, and the key concept to this blog. I have always wanted to tell stories, and I realised that telling captivating stories is something that can be learnt and that takes time to practice. Role-playing games are the perfect medium to practice with, and the games table makes an excellent “dojo”. So here’s to learning to tell thrilling tales together, cheers! Are you ready to discover the secrets of Avernos? Beware, for those who know the truth must choose a side and make a stand. Get your free copy of Avernos—Secrets when you subscribe to the blog. Have you ever taken a look at dragons in the Pathfinder Roleplaying Game: Bestiary ? Have you ever played around with their stats, tweaking them to bring something unexpected to challenge your players? A different set of skills and some feat changes can give you some very interesting concepts. The Covetous Wand Wielding Wurm: Ranks in Appraise, Spellcraft and Use Magic Device give you a wand wielder who knows the worth of every shiny object and has the magic to add it to his collection. The Silver Tongued Serpent: Ranks is Bluff, Diplomacy, Intimidate and Sense Motive makes for the kind of dragon that might send the party on a merry dance, all for her own good. The Slippery Snake: Ranks in Acrobatics (not a class skill for dragons though), Climb, Fly and Stealth make a small or medium dragons particularly deadly. Add feats such as Dodge and Mobility and you’ve got a very tough little worm. Who better to take you on a tour of Japan than Cthulhu himself… um, actually, I can list several better options. Chaosium, for example, have a book, so their’s need to endanger your soul (just the soul of your character). Secrets of Japan is a 360 page book that takes you to modern day Japan, Call of Cthulhu style. It’s loaded with stuff for your investigator, delves deep into Japan and Japanese culture, and expands the Mythos into Asia. We’ve got a bunch of titles that we’re about to publish, some book recommendations, and some lessons learnt from Disney. Enjoy. In my spring break I went to Tokyo Disney Sea, one of the world’s busiest amusement parks. What struck me was how much the park controlled the visitors experience, much like a GM control the player experience (there’s a pun in there somewhere). Here are some ways they achieve this. Visuals: Eye popping architecture, characters in costume, moving sets, smoke machines, lights, darkness. Every visual effect you can think of. We can use candles, light switches, props and costumes for the same effect, if not with the same budget. Elimination of distraction: The park is cleverly designed to keep your eye—and attention—inside the park at all times. This keeps you immersed in the fantasy world that Disney creates. It’s also surprisingly difficult to see the exits to the park and quite easy to get lost in the labyrinth-like layout. Again, this keeps your attention where the park operators want it. The more we limit the distractions, the more our players are immersed in the worlds we create for them. Sound: Sound, even the sound of birds in the trees, can really set the mood. It’s easy to do sound wrong, but I think the best thing is to keep it simple. Use sounds that set the mood you want but don’t distract players. Everyone has a secret, and every secret has a price. Avernos—Secrets is an upcoming free ebook that introduces you to the world of Avernos, a world where a secret war threatens humanity at a time of broken alliances and forgotten destinies. I know you’re as eager as I am to send your gnome from the garden and down into the deadly depths of the earth with Claustrophobia! And you don’t have too long to wait! The layout/artist guru-gnome just sent me a preview of the book, in all it’s illustrated glory, and it looks awesome. But I’m not going to show you anything just yet, I don’t want to spoil the big unveiling. Watch this space, you’ll be blown away. I’m all over Pathfinder Society Quests at the moment. If you don’t know what Quests are, go check out The Silverhex Chronicles on Paizo, it’s a free download and well worth a read. I’ve adopted the quest format for a bunch of once-off games I’m planning to run on Roll20. I’m so busy at the moment that it’s hard to squeeze in a game, but Quests only take an hour or so to play, making them perfect for busy people. Adventure, adventure and more adventure. That’s what we have for you today. Fight a flaming centipede on behalf of the Dragon King, challenge the forces of the Abyss on behalf of humanity or build your own epic encounters. All this and more in today’s epic post. Last week we met with a nasty goblin, and the week before that we fought an oni. This week we have Dragon Kings, singing gold fish and flaming giant centipedes. My Lord Bag of Rice is a story about a brave samurai who faces off with a giant centipede to save the kingdom of the Dragon King. As a reward, he gets an ever–full bag of rice and earns the title “My Lord Bag of Rice”. Scene 1, a bridge over a narrow lake, much like Lake Biwa, the original setting for the story. Across the bridge lies an imperial sea dragon, who is looking for a way to rid his kingdom of a giant centipede that invades his lands nightly, killing his children. If the party attacks the dragon, he fights them for a few rounds before extoling them for their great bravery and asking them to join him. Scene 2, under the waters of the lake. The dragon invites the party to his underwater palace. As they follow him down, the waters part magically for them, keeping them nice and dry (and saving them from Swim checks). If you need some mechanics for this, you could have the dragon give them a pearl to swallow that surrounds them in a bubble and acts as if he had cast Water Breathing on them for 24 hours. While in his palace, the Dragon King throws a banquet for the party, with all kinds of fishy creatures serving magnificent dishes or providing entertainment. This needs some thought, because you want to paint the right picture and create a sense of awe and mystery. It’s also going to be a very different game if you have a druid in your party; if you do, this is their chance to really shine. By the way, if you need some water tiles for this scene, check out our Sea Tiles on Drive Thru RPG. Scene 3, evening in the underwater palace. The Dragon King alerts the party about the coming centipede, which can be clearly seen coming down the mountain because of its flaming eyes and glowing legs. To keep things simple, use a CR appropriate centipede and keep the fire aspect of it purely cosmetic—this is fantasy, after all. Pick a map that gives the party some time to rain down missiles on the monster, while it uses its 40 foot speed to come on like a freight train of flailing legs. For treasure, an appropriately themed and scaled Cornucopia of Plenty could work well at the right level. Otherwise, you could easily make up the treasure quota with bags of rice, a nice bell and bolts of silk. This adventure has two big monsters, so make sure that the CR of the centipede is the higher of the two. Also, how is this centipede making his way to the Dragon Kings palace? Centipedes don’t swim or breathe underwater right? This is a good opportunity to set up a recurring villain, someone who can cast a few spells to make things happen. This villain doesn’t even need to show themselves yet, giving you a seed for your next big, Japan themed adventure. Humans—that self-serving race who do more damage in their short lives than all the minions of the Abyss could in a lifetime of elves. Yet there is some hope, however slim, that this chosen race may realize their place at the head of the coming battle. Pray they do, before it is too late. Last week’s post mysteriously disappeared into the netherwebs. We’re blaming it on a kobito ninja server invasion, although it probably has something to do with the auto post not running properly (or that’s what the kobito ninjas want us to think). As a result, you get two posts from me this week, happy reading! Since I’ve been writing a bunch of Pathfinder encounters—four this month—I thought I’d share a little about my creative process. Encounters make up the heart of an adventure, so building great encounters is worth the effort. First I get a concept. This usually comes from a map or monster that I really like. Specially, I look for an interesting twist that will make for a fun and memorable encounter. Maybe the party has to fight off some orcs, but the orcs are actually fleeing from an owl bear. Maybe that owl bear is a druid trapped in that form because of a failed spell. Maybe the party all get turned into owl bears and get to rampage through the orc camp! Whatever happens, it’ll be better than just fighting a bunch of orcs. I’ll then calculate APL and set up the encounter. At this stage the concept may change a little. I might find that an owl bear is too challenging for my 1st level solo player, or that I need an orc chieftain to fill out the ranks. Maybe I’ll even have a little wiggle room for a small trap or another monster that will spice up the mix. Maybe that owl bear has a goblin “rider” hanging on for dear life. Orc party (6x orcs) appear up ahead on the forest path. They rush the PCs. Orcs try to get past party, fighting if they must. Five minute breather for party to recoup. If not hit hard, scrap this. Raging owl bear storms down forest path. Screaming goblin (Knuckle ‘Ed, lvl 1 warrior) clutches at its back. Perception checks to notice medallion around owl bears neck. Fight with owl bear. More perception checks to notice medallion. If defeated, PCs find medallion (transmogrifies to an owl bear). Owl bear is actually Gunther Firth (level 4 druid). The last thing is just to flesh things out. Build NPCs, stat out the traps, decide what treasure will be up for grabs and so on. Rinse and repeat for all the encounters that make up your adventure. 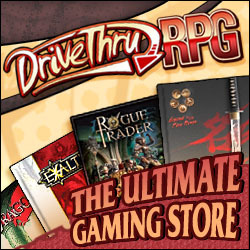 March 4th was GMs day, so don’t forget to buy something nice for the GM in your life at the Drive Thru RPG GMs Day Sale. This post is dedicated to GMs everywhere, you lords and ladies rock! Secretly all of our posts are aimed at GMs, but nobody knows that, shhh. This week is also our first post in the new time slot and we have loads of stuff for you, so let’s dive right in. As promised, this week we venture into the Veiled Lands, the mysterious home of the elves. Next week we’ll go beyond the Veil and into a whole other world, the fae lands. For my Marvel Heroic Roleplaying campaign I made my own Daily Bugle template in Word (docx 863kb). You’re free to share it, just provide a link to this post by way of credit if you do. It helps me to keep doing what I love to do. I use the Bugle to do “in character” session reports, which have been a great way to keep everyone informed and excited for the next session. Yarr, ’tis swell ta be a buccanneer on the high sea, where every day be talk like a pirate day. Our new Sea Tiles let you create vast oceans and rivers on the tabletop. I made them to use with maps I already had in my collection, and I know you’ll find them useful too. Miniatures and raft model not included. The Ogre of Rashomon is a great little tale about a samurai and his battle against the menace of Kyoto, a fearsome oni. It would make for a good adventure. Scene 1, the PCs are asked to investigate a string of murders at the Rashomon gate in town. They discover that all the murders happened at night, the only time the oni comes out, and so they wait for night fall. Scene 2, before the Rashomon gate, during the darkest hours of night. The group is surprised by the oni, who attacks them after using magic like invisibility or darkness. Before the oni is killed, he uses magic to escape into the night. The heroes find his arm lying on the ground. Scene 3, after finding no trail of the oni, several weeks pass before an old lady visits the party. Really the oni in disguise (disguise self), she attacks the party again, seeking to make off with her arm. If she escapes then you’ve got a very interesting recurring villian who might be all sorts of trouble for the party. That arm could even become a much sought after artifact, causing even more headaches as various daimyo send their ninja to claim the appendage. If you’re playing Pathfinder, then both the fire yai and kuwa oni from Bestiary 3 would work, giving you a CR 15 and a CR 4 option, although I like the fire yai more, since he more closely fits the story. I love the Internet, especially the way I can quickly test the strength of a concept. The Book of Faces hasn’t had the response I was hoping for, but that’s okay, because it has been a great chance to learn. As such, I’ve decided to pull the Book of Faces section from future posts. I’d like to thank you for your interest in the project. Choose Your Own Adventure and Fighting Fantasy books were a big part of my youth, and I’ve really enjoyed writing my own adventure for you. Rest assured that the adventure will continue, and you can still play on the Facebook page, but it won’t be a regular weekly feature here from now on. This will give me a chance to work on the book and relaunch it later in a much more polished form. Voting for round 4 of RPG Superstar began this week, with voting open until March 2nd. Are you planning to play through any of the encounters? I’ve been hard at work behind the scenes of Avernos, planning out the next phase of posts that will tie everything together nicely. In the coming months we’ll be digging even deeper into the elves for a bit before we briefly look at humans, then on to my favourite race, the dwarves. Today’s entry is about the Great Betrayal, mentioned last week in the entry on elves. This pivitol moment in the history of Avernos needed its own section, enjoy. Next week we’ll venture into the mysterious Veiled Lands, don’t miss it. We have more adventure than you can fling a prune scone at. Make your move. Post by The Book of Faces. Vote for your next move on the Facebook page or stay updated at the Adventure Chronicle. Don’t forget to Like us on Facebook. Last weeks game of Marvel Heroic Roleplaying was the third session in our campaign, with guest player Brent — from Comics League International — joining us to play the role of the mystical Dr. Strange. To kick things off, Thor, Black Widow and Dr. Strange went after Armadillo, who was rampaging through the streets of New York. The fight went from the street, through the City Bank and into a comic book store, where the heroes discovered old comics about the mysterious Sentry, last seen voluntarily locked up on the Raft. Next up was a hunt for Mjolnir, Thor’s mighty hammer, lost during the fall of the Avengers Mansion. In a battle with the Wrecker and Bulldozer, Strange revealed his secret identity as Loki, when Thor — having found the hammer — summoned it, only to have Strange/Loki throw up an extra-dimensional portal in its path. Thor and Loki took their battle to the frozen wastes of Jotunheim, where Thor, wielding the Wrecker’s crowbar, brought the beat-down Loki deserved. In the final moments of the battle, Loki played his ace, sending the Casket of Ancient Winters through a third portal to Earth. Oh, that Loki. Experience: Both Brent and I have played in at least one session where a PC turned on the party. Brent is also a very capable GM, so I knew I could trust him to deliver an awesome story instead of a nasty TPK. Group Size: For various reasons we ended up with two players, Thor against Loki, which ment that Thor’s player could have felt very isolated if he wasn’t such a great player. I wouldn’t recommend the double-cross for small tables for this very reason. Guest Stars: Brent has to take a four hour long round trip train ride to play with us, so we knew this would probably be a one shot for him. He could be the bad guy without affecting the existing group dynamic. Rewards: One of my players wanted to play Loki, but we just couldn’t figure out how to give her that chance without the fued between Thor and Loki derailing the game. With Loki defeated, and probably stripped of his powers and turned into Kid Loki, it makes much more sense for Loki to be a playable option. Have you ever set up a player vs player double-cross in your own sessions? I’d love to hear about it. Ahoy there me matey! Next month we set sail across vast oceans with Sea Tiles, our next set of game tiles. They’re perfect for expanding the sea and ship maps in your collection and they’re coming soon to Drive Thru RPG. Avernos and the Book of Faces has been taking up most of our time, but we’ve also started work on a mini campaign setting for Pathfinder, which is off with the play testers now. I was introduced to Go, not in Japan, but while LARPing in South Africa. It’s a facinating game which originated in China and is very popular in Japan, even today. It’s easy to learn. The guy who taught me described Go as “takes minutes to learn, a lifetime to master”. I love the complexity that arises from its simple rules. I wonder if they’ll have a Go mini game in Shadowrun: Hong Kong? You can learn how to play Go on Wikipedia, which has a bunch of other insightful links. That’s all from me until next Thursday. Voting for round 3 of RPG Superstar 2015 is now over, with 8 contestants left to bust out an encounter for round 4. Did you have any personal monster favourites? I really liked the Geomaw and the Stonevine Stalker, although I think the Stonevine Stalker needed a lot more to make it stand out. Just think about the Womping-Willow from Harry Potter, or Old Man Willow from The Lord of the Rings and Rockbiter from The NeverEnding Story film. They were all interesting in their way, but none of them were show stealers. Nazguls and Dementors, now those were monsters. This week the Elves take their place in Avernos. Misunderstood, mistrusted and feared, this reclusive race fights an invisible war with a dark evil. Read more about the Elves. We’ve set off down the road and into an ancient forest, where we come to a set of stone steps. Read the adventure and make your choice on the Facebook page. A blow by blow account of the quest is always available at the Adventure Chronicle. Our current Marvel Heroic RP Game is about to kick off it’s third session, with the heroes going in search of Thor’s mighty hammer, Mjolnir. Hopefully a few of the escaped inmates of the Raft will end up back behind bars too. It’s going to be epic. And while we’re on the topic of comics, my buddy Brent over at Comics League International invited me to recorded a podcast with him about the heroes in a half-shell, the Teenage Mutant Ninja Turtles. You can take a listen on his site or iTunes. Here are some more pictures and a video of our Maze Tiles. I’m really proud with the Print-On-Demand version of the tiles, they look amazing. The tiles fit perfectly with other inch grid maps, which was one of our critical criteria for quality control. This means you can expand on your existing collection of maps and tiles with this set for even more adventure options. One of the weird things I collect is tenugui, or Japanese hand towels. Here are a couple of modern ones I found on Amazon. Voting for round 3 of RPG Superstar 2015 has begun. Go check out those monsters. Due to a Japanese national holiday, these sections will return next week. My first game of Call of Cthulhu didn’t happen, probably because of a big event that sucked up the player pool. Never the less, dice were rolled and demons fought, so happiness all around. Instead of CoC we played the Legend of Drizzt D&D Adventure Boardgame, which will soon be joined by a new release for the series, the Temple of Elemental Evil, scheduled for release on April 30th. I’m pretty stocked for that! Also, if you want to play Call of Cthulhu and you only have two interested people, check out Monophobia, A Fear of Solitude. We might give this a try sometime soon. Maze Tiles are a simple and effective solution for building a moving, shifting maze. Complete with levers and gears, these tiles work well as a clockwork dungeon, a gnome’s warren or artificers puzzle. The set includes 4 tiles with unique designs on each face, giving you a total of 8 options to build your mazes with. Available as a PDF download and as Print on Demand. The ninja create perhaps the most evocative of images; that of the skilled, invisible assassin. But what does it really take to be a ninja? Getting whacked a lot, that’s what.